Dancing like ghosts in the shimmering white heat, the dark objects transformed in shape and size until they finally broke through the haze, revealing themselves as humans. Here in the vast and desolate expanse of the Kalahari, people have been able to grind out an existence in this harsh and unfriendly habitat. However, this was not by choice. Bushmen,or San people, have been slowly pushed off the more fertile lands over the years by stronger groups of people. Slowly having to adapt to the ever-increasing harshness of the habitat, the San people have evolved alongside the Kalahari desert itself where everyday existence is a modern David and Goliath story of astronomical proportions. 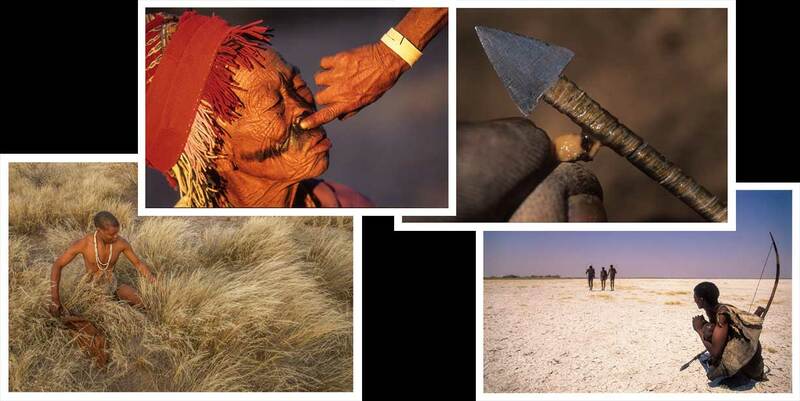 Just imagine a spindly-legged hunter-gatherer being pitted against the mighty Kalahari with all its hardships. Or imagine this same hunter-gatherer with his slight, delicate weapons facing off against the tallest of all land animals: the giraffe. Dressed in a rag-tag array of t-shirts, cut-off denim pants, the slightly-stooped hunters set off in the morning light. It was still early, but the heat had already quelled any bird or insect’s calling. The surrounding bush had assumed the dull colours of winter. However, this can all change in a mere instant when the long-overdue summer rains arrive and paint the desert with splashes of colour, even though it may all last for a short few days or weeks. Hunting and gathering in this type of environment is an endeavor that relies heavily on luck. Some days a single bee may make the difference between returning home with something or returning empty-handed. So, no clue is left uninspected. Every nook, cranny, and hole is checked and re-checked to see if it may deliver a small something, or anything, that could be eaten. Tracks in the sand are something that will always attract attention, especially if they are fresh. It is almost if these people are one with the bush, as they do not seem to “see” as much as they “feel” the presence of an animal. The big bull giraffe had been “sensed” before he had any idea there was anything amiss. The previous morning was spent collecting beetle grubs. Whoever discovered the potent poison in a little insignificant grub buried below the surface of the sand is a mystery. This has been credited to the “Old people” - the forefathers. The only sign of the presence of the grubs is the slightly chewed upon leaves of a Camifora bush. The adult beetle feeds off this bush and then lays its eggs upon the bush, and when the pupa hatches it falls to the ground and tunnels a few inches below to manufacture a cocoon and quietly develops within. Until that is, when it is broken open by the San to get at the grub. A number of grubs are mashed in the bone of a giraffe’s knee joint with a little water and then carefully applied to the arrow shafts. The inner juices of a grub can also be applied directly from the grub to the thin-reeded shaft. This process is completed around a little fire set away from the village to prevent accidents from taking place. The arrows are then dried slowly by the warmth of fire and when are finally ready, they are safely secured in a quiver. Here is where practicality overrules tradition, as many of the quivers are now manufactured from Poly-pipe and not from the traditional bark. The tiny dart is launched from a flimsy looking bow and the only sound is the almost inaudible twang as the sinew on the bow snaps back into its original position. To a giraffe, which has spent many years striding over the dry open plains and pushing his way through the thorns of the Kalahari scrub, the tiny piercing prick is not a shock to the system - merely a slight irritation. No need to suspect anything or even to move off. Two, three, then four arrows piercing the tough hide have the same effect, nothing. The poison works quickly - pumping its way through the large body and the only time the giraffe may suspect something is when his head becomes woozy and he finds it difficult to breathe. Suddenly, his mighty head becomes very heavy and his long athletic legs are bending beneath his weight. A moment later, a tiny speck of a human being rushes forward with a spear and everything goes dark. The hunter has released his arrows without the giraffe becoming aware of his presence and the minute the big bull began to show signs of the poison taking effect, he has snatched up his spear, rushing forward to surgically penetrate the giraffe between the ribs to pierce the heart. The great bull comes crashing down and as the dust settled the last flicker of life left the giraffe’s big brown eyes. Excitement rushes through the village as a returning hunter brings the news. All the able-bodied are collected and the older generation are left with the children. A small happy, cheerful and chattering group forms a procession heading out towards where the great bull was slain. The carcass must be butchered and protected from the clans of spotted hyenas, who, with their unbelievable sense of smell will track down the scent of blood from many miles away. As the fire dies down and the dawn begins to break, it was evident that luck was on their side. No hyenas materialized. With full bellies, the group ensure what remains of the carcass is butchered. No piece of the bull giraffe will go unused. Out here, every little scrap may mean the difference between life and death. While the men hunt, the women gather. A gathering trip is a very social occasion. Young, old - children too - take part. It is as much taking part as it is learning what to do when you take part. Here again, very little is left unchecked. Bushes are checked for fruit, for beetles, and even beneath the bushes are checked for there may be a tiny whisper of a tendril peeking above the sand. This tiny tendril could be the only clue to a rich and nutritious meal lying a couple of feet below the surface. All is shared. Everyone is called over when a bush has a bountiful supply of ripe berries or when a group of trees is harboring a number of edible beetles. All the while, while the serious business of gathering is going on, the joviality, talking and the teasing of one another never stops. This is where the basic principles of life are important. Here bonds between people means the difference between life and death. Because you may be lucky hunting or gathering today but tomorrow your luck may run out. So it is in everyone’s best interest to share and share alike. Upon the return to the village the social gathering does not falter. Everyone gathers in the shade beneath the all-important tree and supplies are pooled and then everyone sets to work preparing the harvested bounty. Meals are healthy affairs consisting of anything that is abundance at that time of the year. Here is a people, who, when an individual is removed from the tight bonds of a family group, wither away before one’s eyes. This is the same story of what happens to most of our traditional hunter/gatherer groups all over the world. It is the harshness of their life, which strengthens the bonds between them, and it is hunger that drives them from their frail beds to go and seek something that will satisfy the hunger pains for a while. The San are possibly amongst the world's most researched and documented group of people. They continue living their traditional lifestyle to this day, still warm and smiling and happy, even if this lifestyle invariable lead to harsher conditions. Take away someone’s reason for living or getting out of bed in the morning and you will have someone who will easily lose their direction in life.